As the Carolinas recover from Hurricane Florence which dumped six months rain on the two states in just a few hours which produced the worst flooding in 73 years a new horror is unfolding. 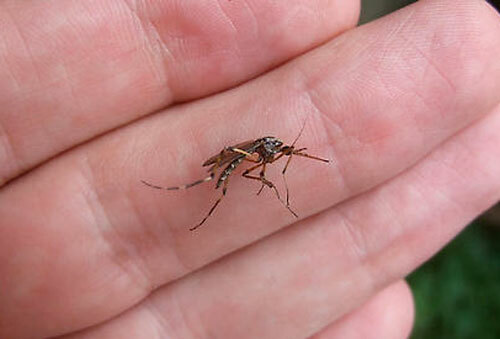 As the flood water recedes leaving thousands of houses damaged from mud and water a mega-mosquito outbreak has occurred. Clouds of monstrous, hyperaggressive mosquitoes, nickel-sized bloodsuckers, known to scientists as Psorophora ciliata have invaded twenty-seven counties in North Carolina alone. “It’s like somebody shoving a hot poker in your arm,” says Turturro. According to the report, all mosquitoes come equipped with serrated mouthparts called maxillae they use to carve through the skin. For most species, these structures are so small and sharp that you don’t feel much more than a tingle to let you know you’ve been bitten. But the gallinipper’s chompers are designed for bigger prey—it’s one of the only species that can pierce cattle hide. Its bite is so deep it sets off nerve cells in the epidermis designed to alert the body to a serious wound. In other words, your body thinks it’s being stabbed.